This pick-up location is super central and easy to find. You can start with a quick bite here as there are numerous cafes and restaurants just down the street. Café Vian, a French Bistro, is my personal favorite as their selection of food will leave even the pickiest eaters happily stuffed. So satisfy your cravings, unlock your bike, adjust the seat, say hi to the guys promoting Budapest bus tours, and off you go. 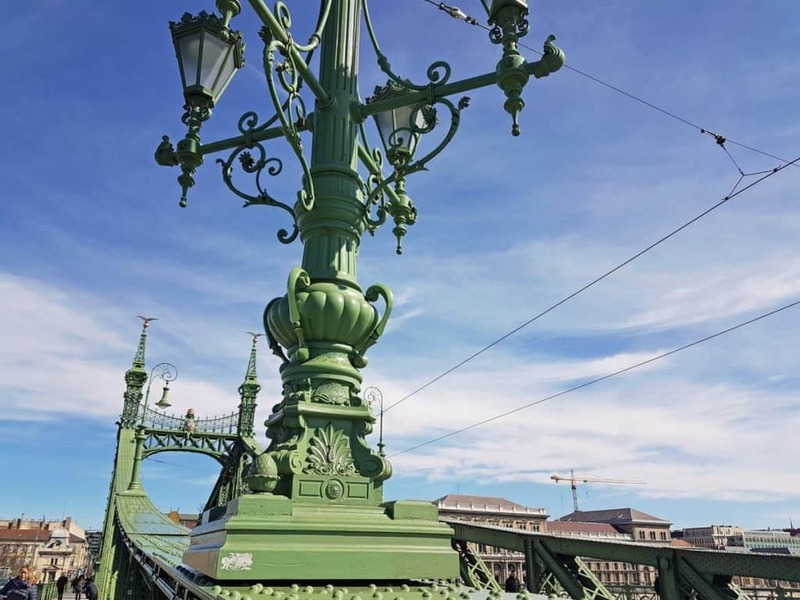 To get to the first stop on this bridges of Budapest bike tour, you will ride past a number of stunning pieces of architecture, including the Opera House on Andrassy Street and the Parliament building. Designed in the Gothic Revival style, the Hungarian Parliament is breathtaking. Make a stop here and take in the view. You can also explore the inside of the Parliament, but make sure to purchase your tickets in advance. Before you get on the bike lane of Margaret Bridge, keep in mind that bridges in Budapest are incredibly busy during the day. 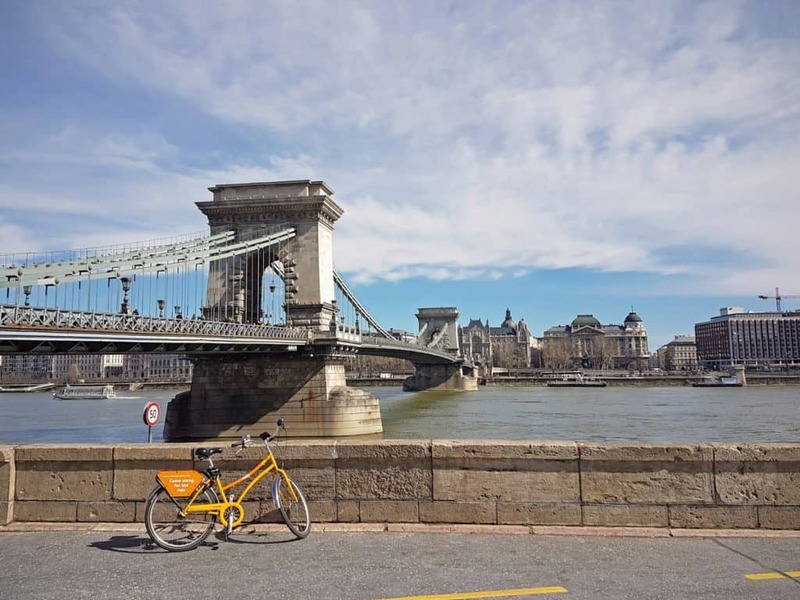 Since they connect two major parts of the city – Buda and Pest – you will see a lot of car, pedestrian, and bike traffic, so be extra cautious. That’s also a reason why an early morning or late evening bike tour of Budapest’s bridges is a great idea! This bridge connects Margaret Island – located smack down in the middle of the river – to both sides of the city. 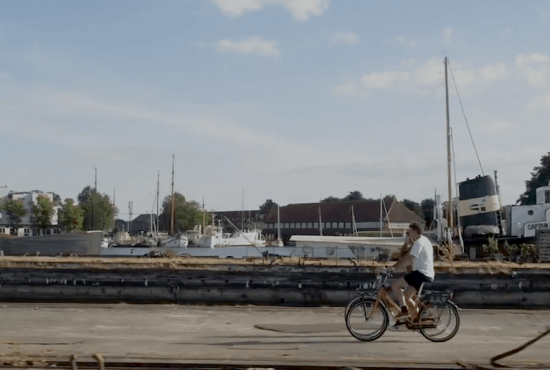 There are a ton of fun things to do here, from spending a few hours at one of the swimming pools, to sipping a refreshing lemonade at a café, to listening to live music, or just throwing your bones under a tree in the park. The island is a nature getaway within the city. The bridge itself is the second oldest in Budapest. Along with the others, it was bombed during World War II and had to be restored. Architecturally, this is not the most impressive bridge off our list, but the view from it is nothing short of spectacular. After you cross the Margaret Bridge, you are officially on the Buda side. 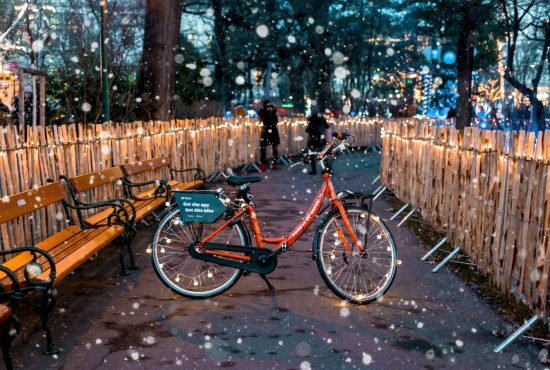 You will be riding along the Danube river, meaning you can enjoy the view of both the Pest side across the river and the hills on the Buda side. It’s a smooth ride down a designated bike lane that is usually not too crowded. It’s perfect. 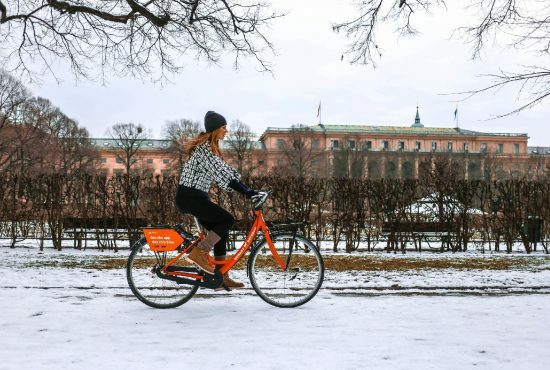 My recommendation is to take this bike route twice – once during day time and once after dark. You will be amazed by how differently the city looks at night. 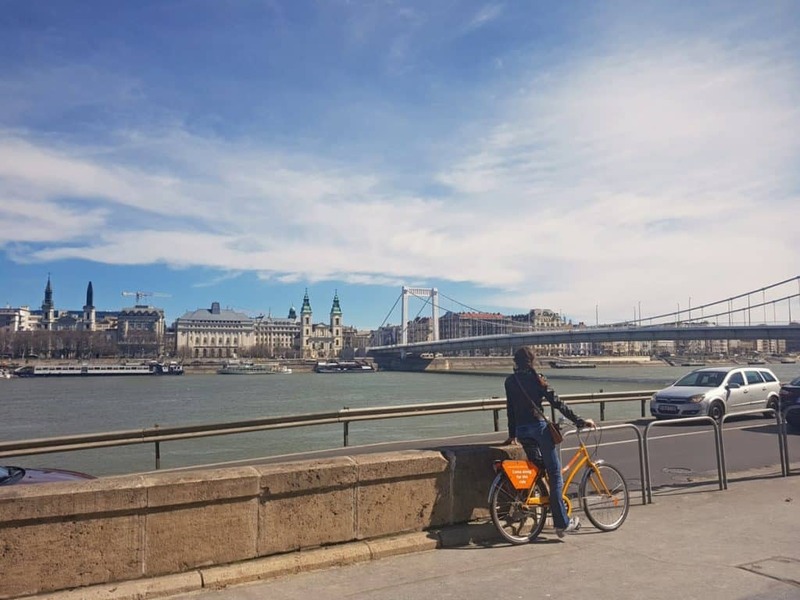 For me, the ride along the Danube river is what Budapest is all about – busy traffic mixed with beautiful architecture mixed with open-terrace cafes, people jogging, chatting, and reading on a bench. It’s the sound of a tram, the beauty of a sunset, and the warm breeze. Trust me, you will fall in love with this city. As you ride your rental bike towards the Chain Bridge, you will see the Parliament building on your left and the Fisherman’s Bastion on your right. It is the first permanent bridge that connected the two banks of the river and arguably the most beautiful one. It was designed by an English engineer and transported piece by piece to Budapest from Britain. Blown up during World War II, the bridge was reconstructed and opened again to the public by 1949. The Chain Bridge in Budapest is often compared to the Charles Bridge in Prague, perhaps because both are in major Eastern European capitals and both are gorgeous. You can instantly see the difference between the Chain Bridge and the Elisabeth Bridge. The former has an imposing presence and you can just feel its history simply by looking at it. The latter has a much more modern, minimalistic look. That’s not because it was built recently. The original bridge was constructed at the end of the 19th century. However, after getting destroyed in the Second World War, it was decided not to stick to the original design during reconstruction. In fact, it took over 20 years for the new bridge to be built. As you ride towards the Elisabeth Bridge, you will be approaching Gellert Hill on your right with the statue of Saint Gellert on top and Gellert baths at the bottom. If you are tired and want to take a break, I would recommend taking advantage of one of the biggest natural spas in the city. Rivaling the Chain Bridge in its beauty, the Liberty Bridge is a dazzling mix of heavy metal structures and intricate, almost airy details. It was the first of all the bridges of Budapest to be reconstructed after the war and featured the first tram line in the city. You will be crossing back to the Pest side over this bridge, but keep in mind that it does not have a designated bike lane, meaning you will either need to ride through the main road or the pedestrian part. I would suggest going with the latter, so you can stop in the middle of the bridge and spend a few minutes admiring the view. I hope you will enjoy this Budapest bike tour as much as I do every time. It is a unique opportunity to see how the city comes together and what makes it so magical. Next time we will be exploring the street art of Budapest and how perfectly it comes together with both elegant and more haunted- looking structures of the city. Until then, you might want to check my other Budapest bike tour here.